When Westminster Bridge was envisaged and built, land had to be bought on the Surrey side for the approach road. Between 1740 and 1746, the Commissioners of Westminster Bridge bought land from the Archbishop of Canterbury and, in Lambeth Marsh, from the Lord Mayor and Commonalty of the City of London. In later years, land on either side of the road was sold or leased for building purposes. (1) One of the houses built there became the hatter’s shop of Charles Holwell. 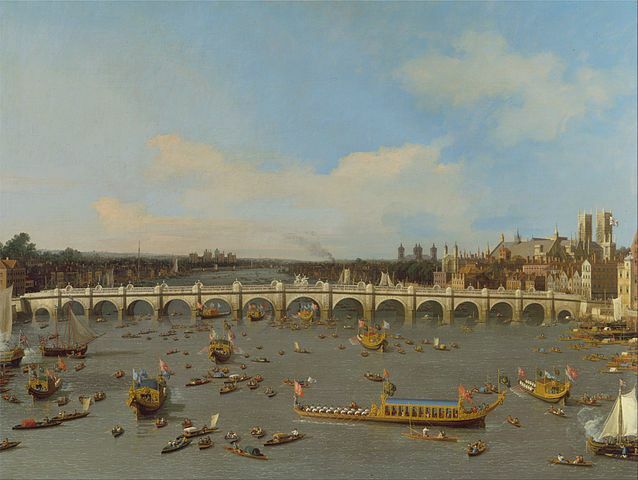 Canaletto, Westminster Bridge, with the Lord Mayor’s Procession on the Thames, 1746 (Source: Google Art Project via Wikipedia). More pictures of the early bridge on the Wikipedia page. Although Holwell is listed in the index of Street View booklet 69, the depiction of the houses only goes as far as number 99. To see the façade of number 100, we have to turn to booklet 80 where it is shown as part of Coade’s Row. The Sun Fire Office registration for 21 May 1831 does refer to the hatter’s shop as being at 3 Coade’s Row, although that is – in the Tallis booklet at least – a property on the other side of the road. Church records for baptisms of the children are just as erratic. When the youngest son Charles junior is baptised in 1830, Charles senior and his wife Mary do not yet live in Bridge Road, but in Isabella Street. 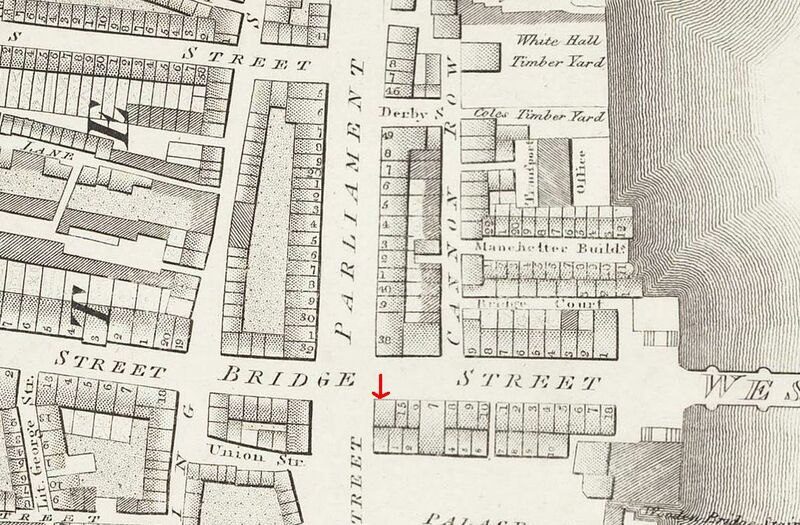 (2) With the next baptism in 1832 (John Bradford), they live on Westminster Bridge Road; in 1834 (Mary Ann) in Coades Row; and in 1837 (Thomas Bradford) and 1841 (Charlotte) on Bridge Road. None of the entries provides a house number, but let’s assume that Charles had his hat shop at 100 Westminster Bridge Road since at least 1832. 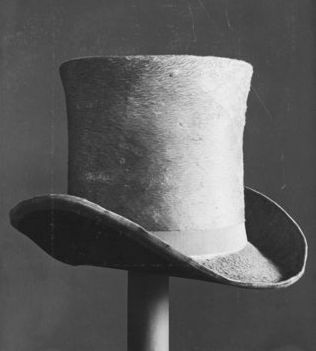 If we follow the census records, Charles sr. and Mary are at Bridge Street in 1841, but in 1851, Mary is listed as widow, ‘hat manufacturer’ with her son Charles as ‘hat maker’ (no idea if the difference between manufacturer and maker signified a difference in status, or whether it was just due to the vagaries of the census taker). Charles senior had died in June 1850 and was buried at Norwood Cemetery. Charles junior continued his father’s business and we see him as hatter in subsequent censuses. In 1853, he married Sophia Lemon and the couple had at least four children (Charles III, Sophia Margaret, James Thomas and Henry William), but as far as I can see, none of them became a hatter. No advertisements for the hat shop nor any hats made by Holwell have turned up so far, so no nice illustration to go with this post, sorry about that. 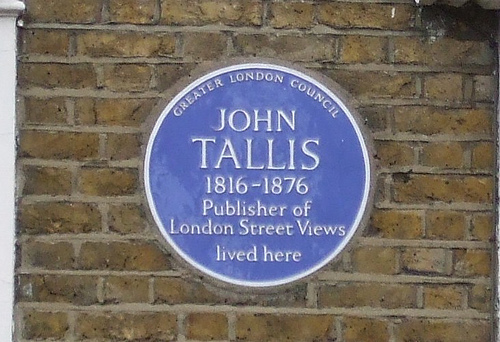 There is another Holwell listed in the Tallis Street Views, but since I have not found out who the parents of Charles senior the hatter are, nor where he was born (the 1841 census just says that he was not born in London), I cannot prove a link between the two families. There is a possibility that Charles is related to Edward, son of Edward Holwell, hat manufacturer of Exeter, who was apprenticed to George King, a vintner, in 1791, but genealogical proof is lacking so far. (1) Survey of London, Volume 23, Lambeth: South Bank and Vauxhall, ed. Howard Roberts and Walter H Godfrey (London, 1951), pp. 69-74 via British History Online (here). (2) There is an earlier insurance record for 1826 in which Charles Holwell, hatter, is paying the premium for 46 Orchard Street. Source: R. Dodsley, London and its Environs, 1761. Sources differ as to whether the Exchequer Coffee House was the one on the right or the one on the left of the entrance. The lease of the coffee house property against the Hall had been in the hands of Alexander Lindsay, 6th Earl of Balcarres, and the under-lessee and occupier of the coffee house was one Mr. Chapman. They were compensated for the loss of the establishment. 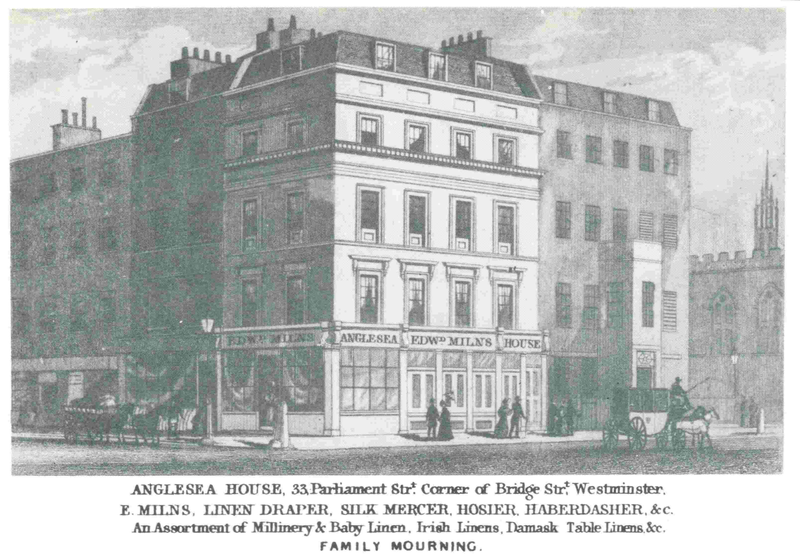 (4) In Boyle’s Court Guide for January 1829, we find Mrs Kendall of the Exchequer Coffee House at 1 New Palace-yard, 14 Bridge Street and 32 Parliament Street. No, she did not have three coffee houses; a look on Horwood’s map shows the properties interconnected and wrapped around Edward Milns’s linen drapery which was situated on the corner of Bridge Street and Parliament Street. 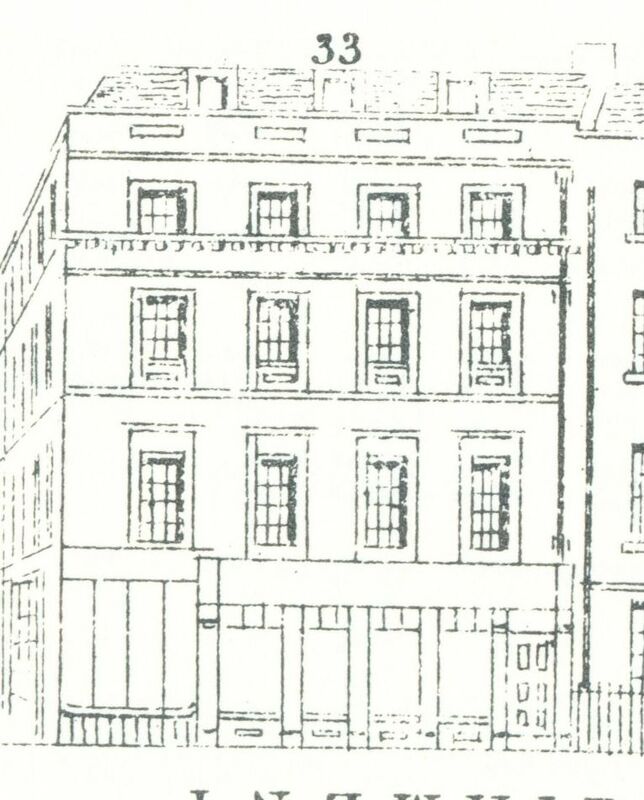 The Parliament Street front of the coffee house can be seen at the top of this post and on the right in the vignette for Milns property in Tallis’ booklet 80 (here). The Bridge Street façade, much narrower, can be seen on the left. I have not found a picture of the Palace Yard front, but if you know of one, please leave a comment. Who Mr. Kendall was – I presume there was one – is unclear [Postscript: yes, there was a Mr Kendall, see the comment by Gwyneth Wilkie], nor do I know when the coffee house started taking in overnight guests and calling itself a hotel, but in 1831, the hotel side of the business was definitely part of the establishment as in that year, one Charles Jones of the Birmingham Political Union wrote a letter to E.J. Littleton which was published in The Morning Chronicle of 19 April. He heads the letter “Fendall’s Hotel, New Palace Yard”. The 1841 census gives Frances Kendall, 65 years old, as the hotel proprietor at 1 Palace Yard. Also living on the premises is one Susan Kendall, 35 years old, but how they are related is not made clear. In the 1851 census, the Exchequer Coffee House has Charles Ritchie as the 30-year old hotel keeper. He is not married, but helping him as housekeeper is Ann Page, a widow, and there is, of course, a whole host of other servants. The 1851 Post Office Directory tells us that Ritchie not only occupied the addresses Mrs Kendall had, but the business had been extended to include number 15 Bridge Street which, in the 1839 Tallis Street View, had been occupied by Mr. Gill, a glass cutter. Ritchie gets a separate entry in the directory for 15 Bridge Street as a tobacconist. The tenant for the last years of the hotel’s existence was Charles Brumfitt. 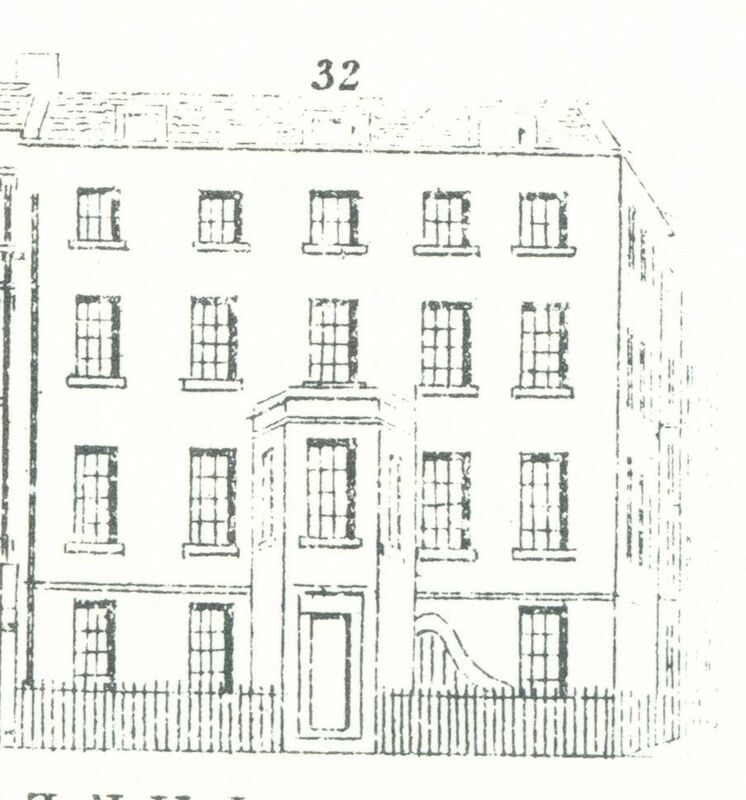 From the list of houses to be demolished for the new approach, we can see that 14 Bridge Street was part dwelling house / part hotel; number 15 was a dwelling house and shop: the Exchequer Cigar Divan (run together with Charles Ritchie)(6); number 32 Parliament Street was a dwelling house / part hotel; and 1 New Palace Yard also part dwelling house / part hotel. (7) The 1861 census tells us that Brumfitt, his family, and the hotel staff were living at 1 New Palace Yard; the other addresses were not mentioned separately, so the census taker apparently considered the whole complex as one unit. As it had already been clear since early in the 1850s that plans were being considered to widen the bridge approach and that the Act with the compulsory purchase orders had been decided in Parliament in 1859, we can well imagine that prospected hotel guests thought it better to book their rooms somewhere else, damaging Brumfitt’s business even before the building had actually disappeared. It is no wonder that he reacted rather fiercely in The Times of 6 January, 1863, where he states that the Daily News of the 2nd saying that “notice had been given, on the previous day, to the owners and occupiers of the remaining houses […] that they would have to vacate in the course of the month” was utterly and totally wrong and “WITHOUT FOUNDATION” [his capitals] as he was “under no notice whatever from the Board of Works or from any other quarter” and that committees, etc. requiring rooms were welcome “during the ensuing session”. It is of course true, as we have learned from Cowper’s answer in the Commons, that it was thought best to let the hotel stand as long as possible, but ‘without foundation’ is a gross misrepresentation of the situation. Brumfitt must have realised that eviction was unavoidable, although he may not have known the exact date. 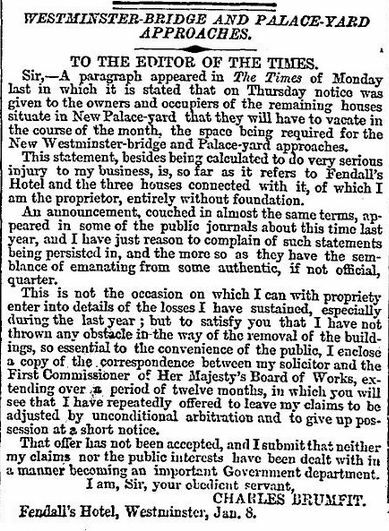 He may even have regretted his initial outburst as a few days later, a letter from Brumfitt to the editor was published which is couched in far more moderate wording, although we can still read between the lines that Brumfitt was not very happy about the financial compensation he was to get and had put his solicitor onto it. (1) Footnote 2 on page 83 of Ralph Rylance, The Epicure’s Almanach: Eating and Drinking in Regency London, ed. Janet Ing Freeman (2012). 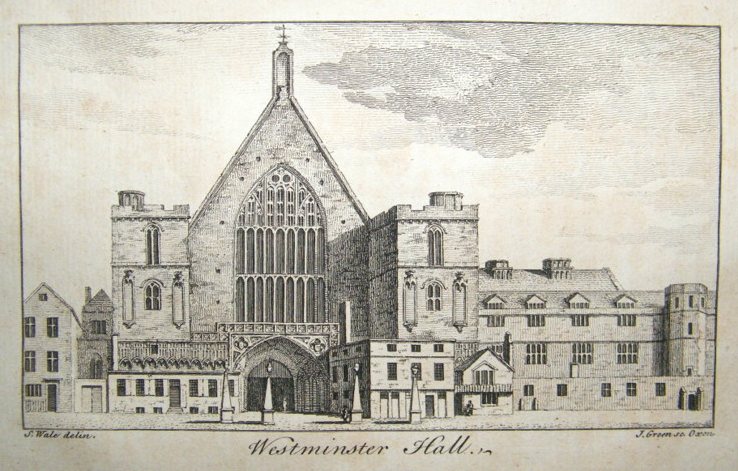 (2) Samuel Ireland, Picturesque views, with an historical account of the Inns of court, in London and Westminster (1800), pp. 227-228. (3) John Thomas Smith, Antiquities of Westminster (1807), p. 267. (5) Hansard, HC Deb 05 March 1863 vol 169 c1067. (6) See this Londonist page for the history of tobacco in London and the first divan. (7) The Statues of the United Kingdom of Great Britain and Ireland, vol. 22. The schedule of the houses to be removed is part of Act C.58 22 & 23 Victoria. (8) Andrew Halliday, Sunnyside Papers (1866), p. 257. 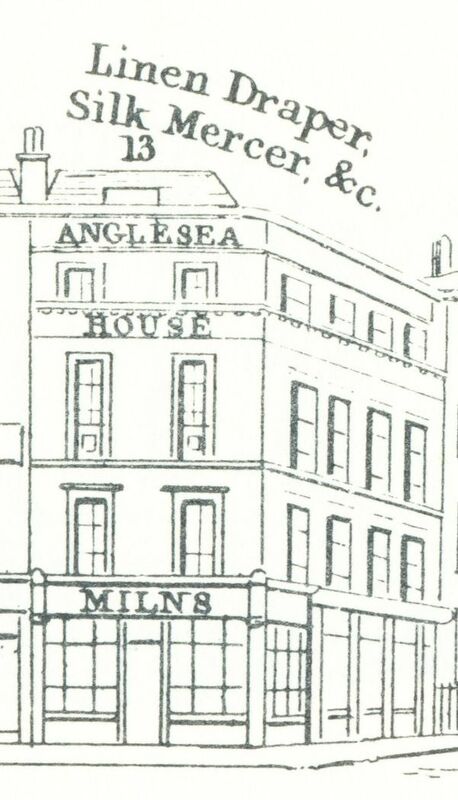 Milns’ drapery could be found on the corner of Parliament Street and Bridge Street and had two house numbers, one for either street, but we are just talking about one shop, called Anglesea House, but why it is called that is unclear. The earliest reference I found for Edward Milns is an 1827 entry in the Sun Fire Office papers where he is described as linen draper and laceman at 33 Parliament Street. He was to marry four years later to Elizabeth Briant. (1) The position of his shop turned out to be a lucky one, as on 25 June, 1838, Edward advertised in The Morning Post that for the coronation of Queen Victoria a few days later, he had “a few good front seats to be let; also a shop front and the use of a shop and balcony outside, commanding a most extensive view of the procession”. Edward obviously saw the festivities as an opportunity to make a bit of money. Edward and Elizabeth Milns do not seem to have had any children. In the 1841 census, no children are mentioned, just three male and three female servants. The servants are not given a distinct occupation other than servant, but in the 1851 census, the information is more elaborate and we learn that besides Edward, his wife, his wife’s sister Mary, a nephew Robert, and two visitors, there are also living on the premises three male draper’s assistants, one male apprentice, one young male servant, and one female servant. We also learn from the 1851 census that Edward was born in Lusby, Lincolnshire, c. 1801. Elizabeth originally came from Wiltshire and was a few years younger than Edward. Fast forward another ten years to 1861, when Edward, his wife, the sister and the nephew can still be found in Parliament Street, but this time with just two male assistants and one female servant. We do not necessarily have to read into this that the business was going down as assistants need not necessarily have lived above the shop, but things were certainly about to change. In 1859, Parliament passed the “Westminster Bridge Act” (C.58 22 & 23 Victoria) in which the widening of the western approach road to the new bridge was set out. In other words, Milns (and his neighbours) were to be bought out and their houses and shops removed to be able to widen Bridge Street. But, government departments are not always as efficient as they should or could be (nothing changes) and the Office of Works had neglected to serve the required notices of the compulsory purchase orders to some of the occupants and the whole process was delayed. (4) No wonder Milns could still be found in his shop in 1861, but in the end, the shop had to be demolished. (1) The marriage took place at St. Mark’s, Kennington, on 6 October 1831. (2) The Examiner, 30 March, 1844. (3) H.L. Malchow, Gentlemen Capitalists. The Social and Political World of the Victorian Businessman (1991), p. 260-261. 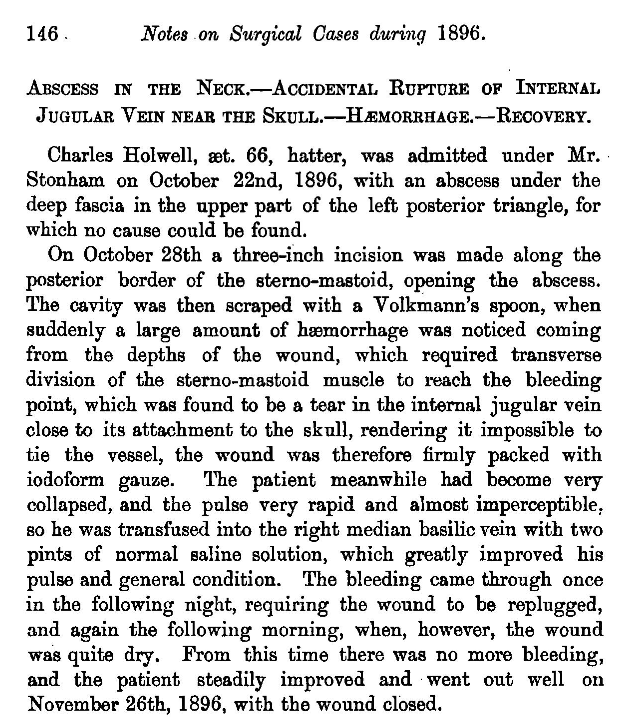 (4) The Observer, 11 December, 1859. (5) The London Gazette, 25 June, 1861. (6) England & Wales, National Probate Calendar (Index of Wills and Administrations), 1884 and 1890. When Edward died, the estate was valued at £31,323. Elizabeth left £29,870.